curcumin. It has significant anti-inflammatory properties as well as a host of other health benefits. Turmeric is also fantastic for digestion and cleansing the liver which is the “filter” for our body. the earthy-acridness of the spice enough that the tea is simply delicious. Udo’s oil added at the end is full of DHA that helps with inflammation. I use coconut milk because it is full of healthy fats and is so good for you! Turmeric tends to stain anything it comes into contact with, so be careful! sweetener and oil. Let sit for 5 minutes and then remove ginger slices. 2. Whisk in the lemon, oil and maple syrup just before serving hot. 3. For a frothy and creamy consistency use an immersion blender and blend for 10-15 seconds. 4. Top off with grated nutmeg and stir now and then as you drink so all the good stuff doesn’t settle to the bottom. This is the beverage recipe the Guilford College Students asked for. Serves 6-8 full glasses over ice. We love this beverage especially in summer. It has very little added sugar compared to most punch recipes and it is so refreshing as well as so good for you! Try serving it several hours after making it as all the flavors really come together. In a small saucepan, bring the water almost to a boil over medium-high heat. Do not let water boil. Turn off the heat, pour over the tea, crushed ginger and mint. Let steep for 4 minutes. While pouring tea into a large pitcher, strain the solids pressing the liquid out and let tea cool about 30 minutes. Add all of the juices. Refrigerate over night or until ready to serve. To serve, pour all over ice. Garnish with fresh mint sprigs, if desired. 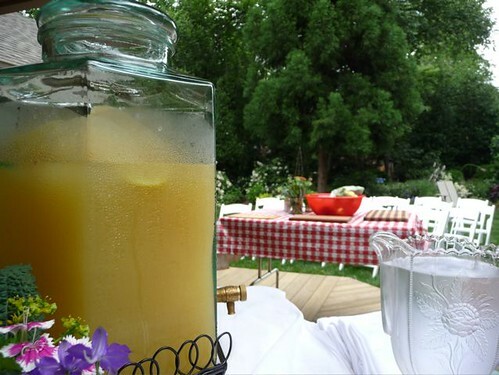 One of the tastiest drinks we serve in the garden seems to be this punch as I receive many comments about how good it is. Poured over ice it is refreshing and has great flavor. In the spring when lemon balm is at it’s peak gather some and surprise your guests with a great beverage. They will never guess your secret ingredient! The night before or several hours prior to serving bruise the bunches of lemon balm and mint between your hands to release flavor. Place them in a large crock or pitcher, and cover with the juices and lemon slices. Chill thoroughly. If possible stir while pressing down on herbs with back of a wooden spoon. Remove the herbs (they will have discolored) squeezing them and replace with a few fresh herb sprigs. Pour punch into iced glasses with lime slices, and a sprig of fresh lemon balm or mint. Pull up a chair and enjoy this in your own garden.